Has the show already begun? Seemingly at random the dancers warm up, stretch and relax. A rehearsal situation. Then a blackout. 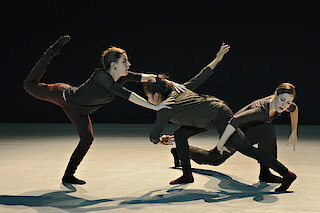 To a remix of violins, beats, scratching and opera the six dancers interweave like snakes in quasi-filmic sequences. Using rich gestures they mix the stubborn staccato hip-hop and break dance rhythms with classical elements, recalling society dances from past époques. And creating a meticulous study on the ambivalence of human relationships somewhere between acceptance and rejection, exclusion and segregation, empathy and loneliness.